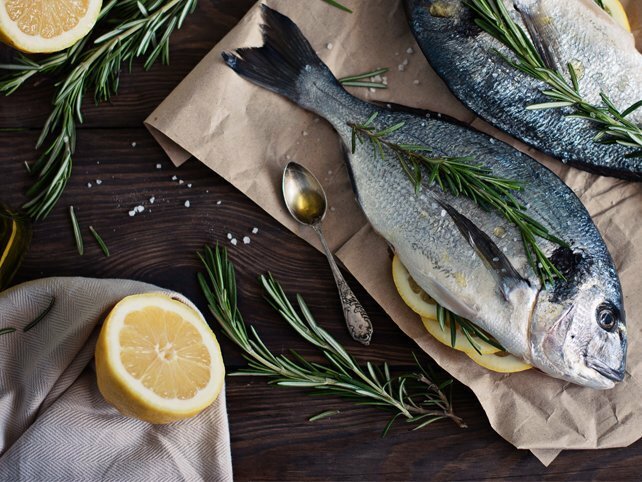 Fish can be not only varied and really savory, but it contributes to our healty and balanced diet. It contaains plenty of vitamins, minerals and butyric acid, which the organism needs to maintain. Trader offer various kinds of fish which, depending on their habitat, can be divided in two types - freshwater and seawater fish. Freshwater fish live in rivers and lakes. 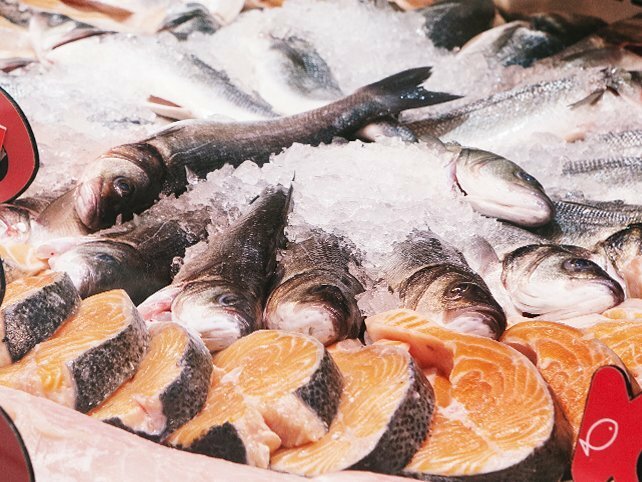 The popular kinds include salmon, trout, carp, silver carp, European catfish, pike, etc. The choice of sea fish is very large, the most popular being garfish, belted bonito, scad, mackerel, bass, gilt-head brim, turbot, wedge sole, etc. 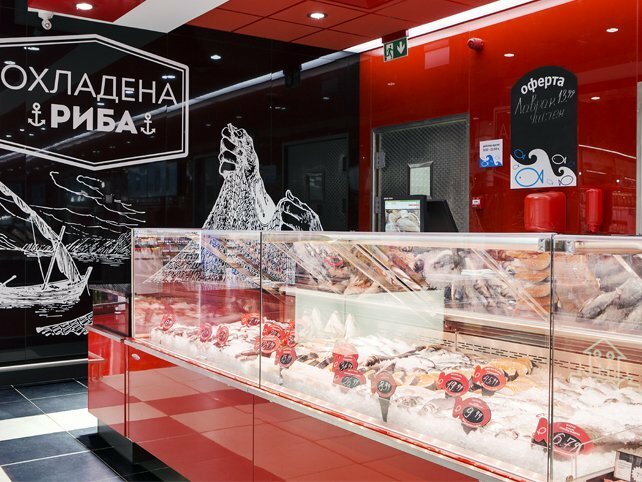 Our fish counter offers a very rich choice of fresh fish. There you can buy: salmon, trout, carp, silver carp, garfish, belted bonito, scad, mackerel, European bass, gilt-head brim, wedge sole, salmon trout, tilapia, goby, red mullet, American catfish, European catfish, swordfish, dentex, scorpid, John Dory, chub, perch, codfish, crab, marlin, butterfish, pangassius, tuna, fagri, frissa, halibut, herrings. Our seafood proposals include: shrimp, squid tubes, squid tentacles, mussel, octopus and oysters. Here you can chose and indicate yourself the product you want to buy. Fish can be extremely beneficial to human health and immunity. Omega-3 fatty accids, contained in fish, have positive effect on the cardiovascular system. They improve the blood circulation, blood pressure and are transformed in molecules with anti-inflamatory effect. 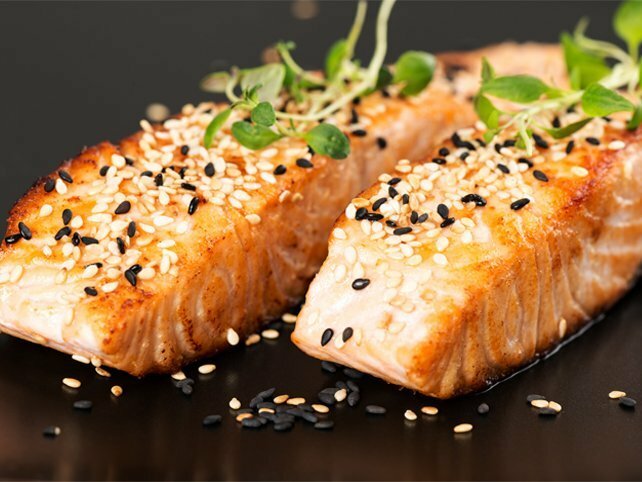 It is important to know that they are the so called essential fatty acids which the human organism is unable to produce, so it is necessary to provide them from external sources. Omega-3 have a key role in the formation of grey matter in the brain, especially in the zones rersponsible for emotions. It has been established that people who consume Omega-3 enjoy both good memory and concentration and good tone and good spirits. In addition to all health advantages, the intake of Omega-3 supports the immune system. Fish can be cooked in many ways. Here are some of them: Poaching: this is one of the easiest and best manners for cooking fish. Poaching is a process of boilinhg a product in water or other liquid at temperature of 70-80 degrees Celsius. The fish may be pouced in speciall bouillon with spices or vegetables, in water, addin at the end olive oil or lemon juice. The advantage is that this is considerably cleaner manner of cooking, the fish remains whole, the valuable minerals and vitamins in the meat are preserved, while the taste may be various depending on the buillon. Steam cooking: this technology is perfect for cooking spicy and delicate fish. This practice is extremely beneficial and healthy practice which preserves to a maximum the taste, color, aroma and form of the product. It is suitable both for whole fish and fillet. Roasting: fish may be roasted in a pan or oven. If you decide to roast it in the oven, you should take care not to dry it. You can pour on it some sauce or cover it with vegetables. If you wrap it in foil of baking paper, it will certainly remain juicy. Grill: Usually the fish is laid whole on the grill. To avoid burning, it would be better to cover it with foil. You can find many suggestions for savory fish meals in our Recipes section!